Step into the witches lab. What do you see in your mind? The rundown room probably has something boiling away in a smokey cauldron at the fire. There's probably a rocking chair in the corner with a cat curled up on some raggedy blanket. Herbs hang from the ceiling, mysterious ingredients lie in wait in canisters that line the windows. there might even be a human skull or two decorating the mantel. Now, you can bring all these elements into your home for a witchy feel for your next gathering but if you really truly want to bring that mysterious ambiance to your humble abode, you're going to need the right lighting! 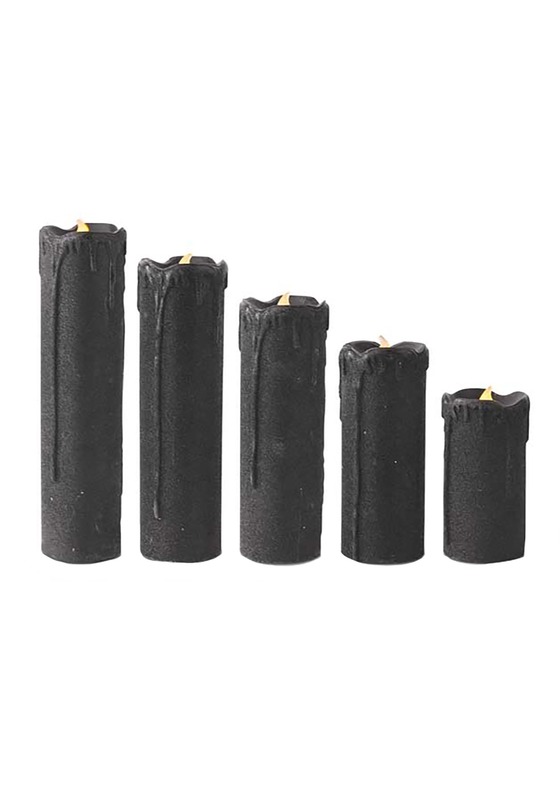 This set of five LED candles will let you set a candlelit tone throughout your home without worrying about the danger of fire. Make your display extra dynamic with different heights for layers in your decor. With subtle glitter and a shining flame, these will add light to your home while keeping the feeling mysterious. There's nothing like candles to add a little romance to your home. You can let these burn in your windows even while you're gone without worrying about accidents. About time we could get poetic without the panic!